After the Mercury retrograde in March, which mostly likely slowed things considerably at work, you’ll feel back in your usual groove. Mercury is moving forward once again, and with the Sun in “let’s get going!” Aries at the start of April, you may feel tempted to rush ahead right away. But hold on a little bit longer! From April 1 through 5, the Moon will be at the close of her monthly cycle as she moves through the balsamic Moon phase. That’s the quietest, most dreamy and mysterious of all the Moon’s many phases – and the best for meditation and introspection. If you wait until the new Moon of April 5, you’ll find that circumstances begin to flow in your direction, making everything more lively and more smooth so you can make fresh starts as you desire. With the Sun moving through Aries, siblings and communication will enter the spotlight in your life. As of April 5, you’ll have an outstanding two week period to spend more time with brothers and sisters (and close cousins or friends who feel like your sibs). Enjoy texting, talking, and socializing with them. You also may decide to sign up for a wellness run or friendly sports competition to raise money for charity, or you could decide to plan a family vacation or reunion. Communication of all kinds also will benefit from fresh energy. If you need to give a speech or want to improve your presentation skills, sign up for a class or hire a coach. Marketing and social media projects also can move ahead this month, as can efforts to learn a new language, polish a manuscript, or start a report. So hit the ground running on April 5 and prepare to shine through brilliant conversation and writing! On April 20, the Sun leaves Aries for tradition loving Taurus. That’s the time for you to shift focus to home and family and how your fit into the family tree. If you live at home, you may wish to get a place of your own. Taurus’s energies can inspire you to save up to make your dream a reality. It also can help you beautify your digs with new paint, help from an interior decorator, or even a major remodeling project. If you want to move, perhaps to have enough room to invite a parent to live with you, start looking at properties and interview real estate professionals. You also may become interested in genealogy. Talk to older relatives, start writing an oral history of your clan, or have your DNA tested to learn more about the mysteries of your origins. The full Moon on April 19 will be the second in a row in pleasure loving Libra. Use clues from that period to guide you this time. You may learn important news related to overseas connections, international business, a major publishing or media project, or an immigration or travel situation. You may have a breakthrough in any of these areas. If you’re in college (or want to get a degree), you also could hear something related to your education goals. Pay attention to any information revealed during this time. 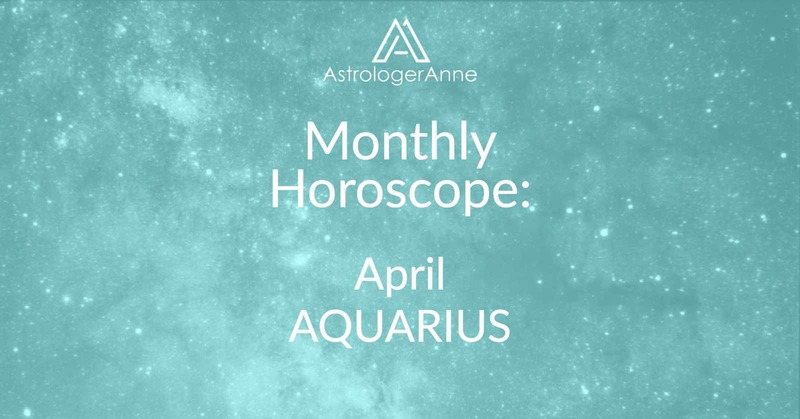 Have a happy April, Aquarius! I wish you a wonderful month!